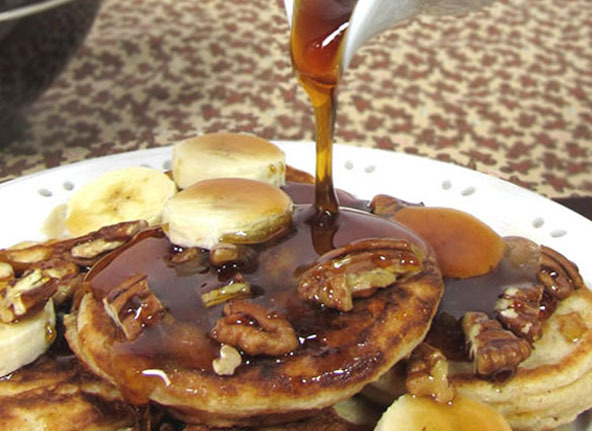 Maple syrup is delicious on its own as a topping for pancakes. But for those not yet use to the deep rich taste of maple syrup (like kids that are use to the junktarian processed high fructose corn syrup with maple flavoring) it helps to blend maple syrup with other whole sweeteners. After some time, maple syrup on its own will be loved and enjoyed by everyone. Meanwhile, try this blend on your kids. Can warm up in a small pot on the stove over low heat. Keep left-overs in an glass jar with a lid in the refrigerator. Taste great on Oat-rageous Quinoa Pancakes or Sannette Judy's Delicious Waffles. This is a much less refined version of pancake syrup than you will find on any supermarket shelf. Although it actually has nutrients, use it sparingly and on rare occasions, as it is high on the GI and will spike ones insulin.